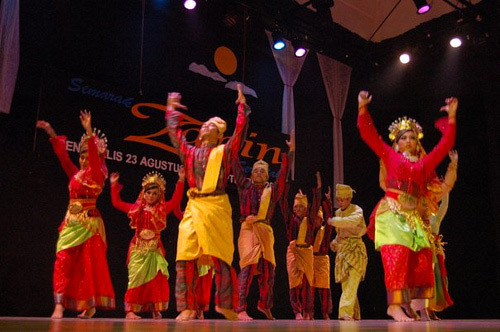 Zapin Dance is a dance that is popular in Malaysia and in Indonesia, especially in Malay-populated provinces in Sumatera (Riau Province, Jambi province, Riau Islands Province, North Sumatera, and Bangka-Belitung Islands) and West Kalimantan. It is believed that this dance has been introduced by Arab immigrant, Muslim missionaries from the Middle East in the fourteenth century. In the old days, it only males were allowed to perform; nowadays, female dancers are included. It used to be performed exclusively for religious ceremonies but through the years it has become a form of traditional entertainment, hence the participation of female dancers is allowed. The dancers usually perform in pairs and are accompanied by a traditional music ensemble which normally consists of the gambus, accordion, rebab, marwas (bongos), rebana (drum) and dok.